Show your hospitality by putting out only the finest in linen. This set of napkins is adorned with a remarkable black cross that looks very much like a wrought iron piece of art. 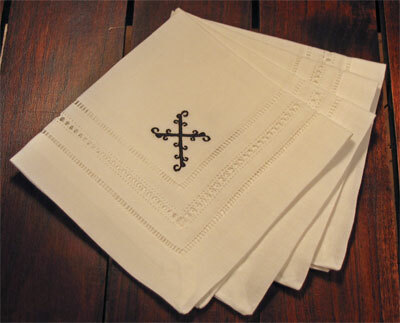 The cross has been embroidered in a black thread onto the white Linen Gilucci & Hemstitch napkins. Each napkin is 100% fine Irish linen and measures 12" x 12". 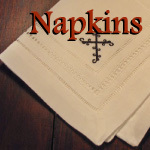 These napkins are embroidered by True Vine Embroidery and are offered exclusively through ChristianGiftsPlace.com.